We Drink Your Milkshake! : MAN OF STEEL Trailers Drop! MAN OF STEEL Trailers Drop! Attached to THE DARK KNIGHT RISES this weekend was the much anticipated teaser for MAN OF STEEL. Now, since we saw Batman at an IMAX screening, we did not get to see this trailer. Strangely enough, we didn't have any trailers before RISES. But never fear, that's what the internet is for! There are two different versions of the trailer. Well, it's actually the same version but with two different voice overs: one by Kevin Costner, as Superman's dad, Jonathan Kent, and the other by Russell Crowe, as Superman's biological father, Jor-El. So what happened to director Zack Snyder? This is so different than anything else we've seen from him so far. In fact, up until the last shot, I began to question whether I was watching a trailer for a superhero movie or some indie coming of age story. But I dig what I see so far. 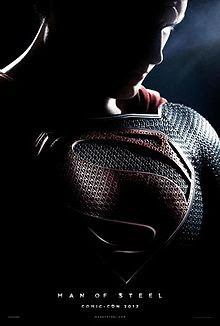 MAN OF STEEL will be released June 14, 2013 starring Henry Cavill, Amy Adams, Michael Shannon, Kevin Costner, Diane Lane, and Russell Crowe.